Your online partner to help you strategize, execute, and succeed. With millions of outlets online, online ally is here to help you strategize which channels are right for you. 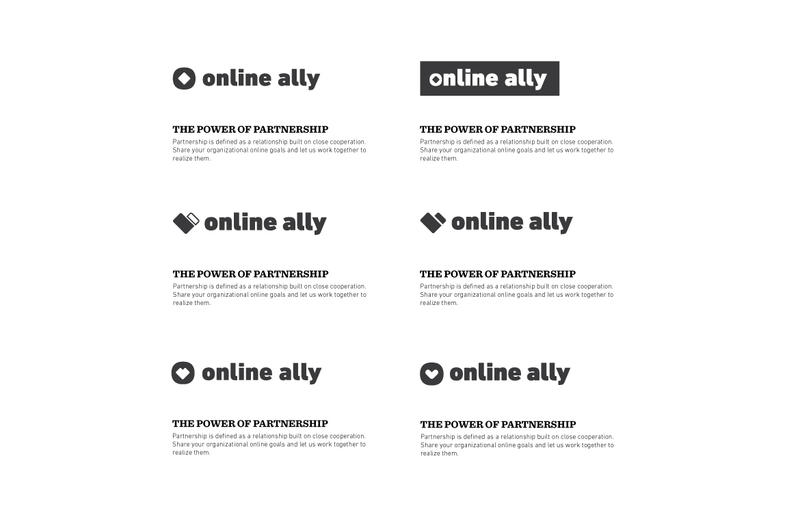 Summer Ellison Design helped Online Ally by rebranding their identity. With a focus on a new logo, Summer Ellison Design and Online Ally began the transformation into a friendlier, cleaner experience. This new "tech savvy" look allows for greater trust with potential clients, as Online Ally seems more knowledgable of current trends than their previous design. Bold texts establish both a sense of hierarchy and priority, the decision to make a bold logo adds to the feeling that we are "allies" with the client, in other words, the client is the priority. Grabbing the viewers attention, and if only subtly, further convincing the potential client as a priority - an "ally" or friend. The thick font helps create an instant desire to trust. The modern handshake implies unity and team work while still maintaining the feel of an icon, keeping it in the tech realm.